As social media continues to rule supreme amongst all demographics and ages, we have taken a look at the relative popularity of the social web amongst the critical early adopter teenage market. As the chart shows, Facebook is still the king amongst this critical user base. contrary to a lot of reports suggesting otherwise, Facebook actually became more popular with teens from 2011 to 2012, despite fears from Facebook that the younger market was moving towards Instagram, Twitter and Tumblr. 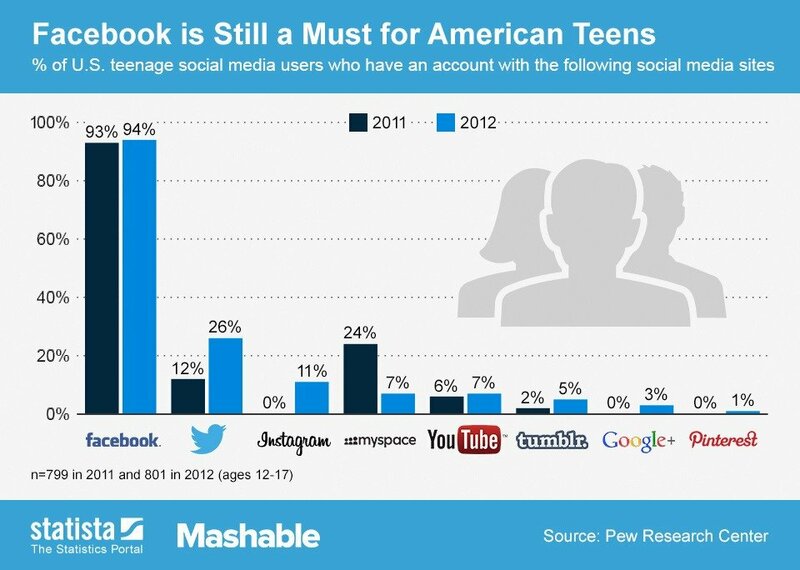 With 94% of Americas teenagers on the network, Facebook’s penetration in 2012 was simply stunning. No doubt, the gap between Twitter and Facebook is much closer now than it was in 2012 though. The chart illustrates the rapid growth that twitter was experiencing amongst these users in 2012, where an additional 10% of Americas teens joined Twitter in that year. If such growth was maintained, and we have no reason to think otherwise, then Twitter is probably looking at having around 60% of America’s teens on board in 2013. Instagram was the largest grower of the new boys, going from 0 percent to 11% of the market in just one year. Pinterest’s emergence came just in time for this chart to capture the beginnings of its growth, and it’s another one that will be fascinating to observe when the 2013 data becomes apparent. YouTube’s membership figures don;t give its use credit, as it’s the only site amongst these seven social networks that does not compel the user to be a member in order to get the full experience. As the Worlds second largest search engine, needless to say YouTube sees many more than 6 percent of Americas teens.